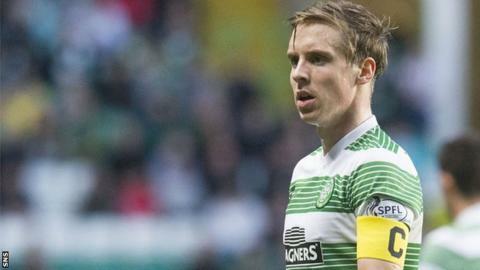 Stefan Johansen says missing out on the treble has made him even more hungry for success at Celtic. Celtic have secured the Scottish Premiership title and League Cup but lost in the Scottish Cup semi-final. "When you get so close to a treble, it makes you more motivated for next year," said the 24-year-old, named PFA Scotland player of the year on Sunday. "You see it's hard work, but it's still possible. Things look very well for Celtic right now." Speculation has linked midfielder Johansen with a move to other clubs, but he still has goals to realise with the Glasgow club. "I came to Celtic to win trophies and I have won the league two times in a row and this year we won the League Cup as well," said the Norway international. "I am still ambitious to win more trophies with Celtic and all the players and all the fans want us to be in the Champions League. "That's an experience I've never had as a football player, so I'm looking forward to next season." Johansen, who comes from Vardo in the extreme north east of Norway, hopes that winning the PFA Scotland player of the year award can inspire kids back in his home town, including his younger brother, Simon. "I have had messages and texts from Norway, so you realise it's big over there as well," he said. "I come from a city where there are less than 2,000 living, so it's important for me to show that, even if you live in a small city like this, you can do well in football. "And I hope it's a good inspiration for the kids over there. My brother is also young and I hope he can use this as an inspiration." Johansen won player of the year awards two seasons in a row while with Stromsgodset before his move to Celtic in January 2014. "Nothing negative about Stromsgodset, but to get it at a huge club like Celtic is a huge thing for me," he said. "It is my first full season as well, so I'm very proud to get the award and I got the one from the Celtic fans as well. "It is an honour, especially when you think of the quality we have here at Celtic and at the other clubs as well." Johansen admits that being joined at Celtic last summer by his former coach at Stromsgodset, Ronny Deila, helped him move to a more advanced midfield position. "In that position, you need to score more goals and assists," he said. "I have been working on that this year because obviously I haven't been a typical goalscorer in the last couple of seasons. "I went into the team pretty quickly, but it takes some time to adapt to the game here. "It is a little bit more physical than in Norway and the tempo is higher."